Unroll the crescent rolls, but don't take them a part. With the dough, place one rectangle (two triangles together) on a cutting board, then place another rectangle on top. In one corner of the rectangle, using a biscuit cutter or a glass (2 to 3 inches wide) cut a circle out of the dough. Then using a smaller circle, cut a circle out of the middle. Do the same to the other corner and remaining dough. Roll the rest of the dough out to make one more donut. Then repeat with the other two rectangles. You should get 6 donuts. Heat 2 cups oil in a skillet. When it's hot enough, place the donut in for just a few seconds. Turn them over and cook for a few more seconds. You want each side to be a light brown, but don't leave them in too long or they will be saturated with oil. To make the glaze, whisk the powdered sugar and the milk together. Let the donuts cool for a few minutes and then drizzle the glaze over the top. Top with caramel and sea salt. 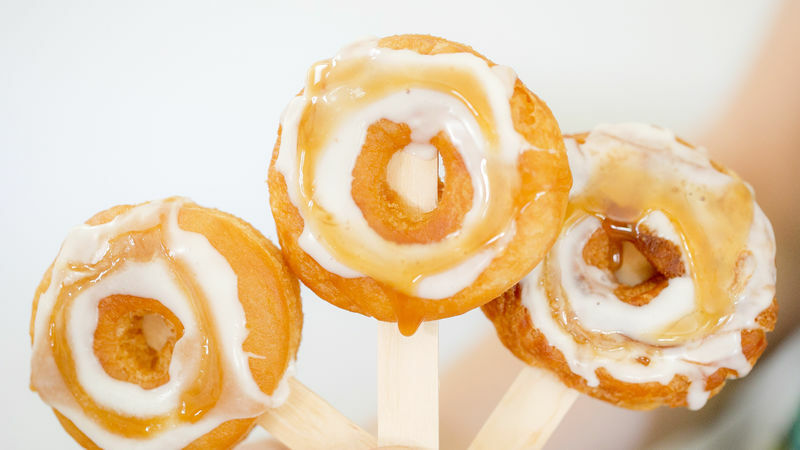 If you want to serve them on a stick, just place it in the bottom and all the way through the middle to the top! There is a croissant doughnut epidemic that has hit the country! This new treat is flaky and irresistible half donut, half croissant - a masterpiece that Chef Dominique created in New York City. People are waking up at 4 a.m. and waiting in line for hours for ONE of these! It has inspired us to make our own version at home using easy and simple ingredients, like Pillsbury Crescent Rolls... and trust me, you might not go back to the original doughnut after these. 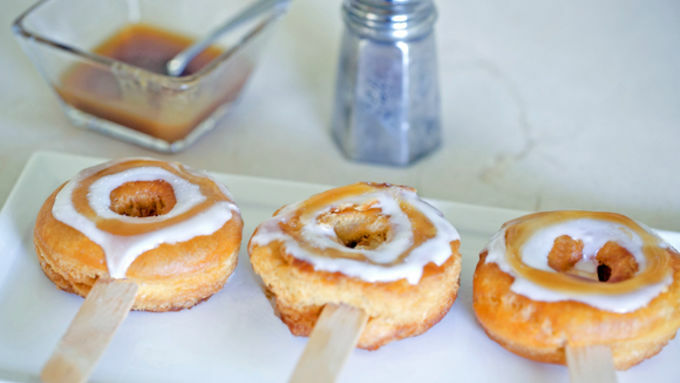 Salted Caramel Crescent Donuts on a Stick are buttery, flaky and airy and just down right amazing. You can fill them with custard, jam or just eat them plain with a little glaze topping. I also thought it would be cute to give them a little carnival twist and serve them on a stick. State Fair anyone? The combinations and options are endless with these, so have fun!